Famous designers tend to give reign to their imagination and create clothes that look interesting and guided by the desire to attract attention. 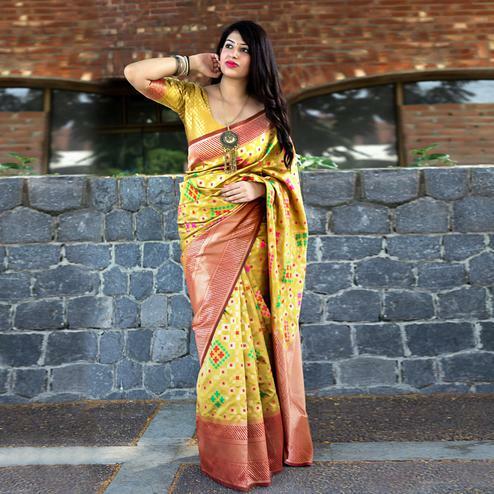 Be ready to slip in the comfort zone of this flaunt yellow colored georgette silk saree. The saree attire is enhanced with jari therad embroidery work & stone work. Paired with embroidered banglori silk unstitched blouse piece. It's a must have saree in your ethnic collection. This designer saree is perfect for your upcoming wedding functions, parties, events or occasions. Pair it with traditionally stylish accessories to complete the look.